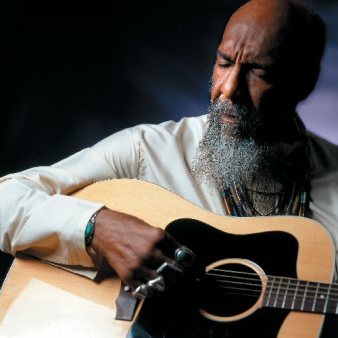 “For some odd reason, I know everybody,” says Richie Havens. Whether it was destiny or a cosmic hiccup, the musical climax of the ’60s was an auspicious day for Havens when an unplanned three-hour set opening the Woodstock Festival opened his doorway to worldwide recognition. “We landed, they chased me, I went on,” he explains. And yet, even if things hadn’t gone down that way, Havens would still have made his mark on rock history as a graduate of the original Greenwich Village folk scene, as a writer and interpreter of substantive songs, and as the third point in the magic triangle that connects Bob Dylan and Jimi Hendrix. With his ears that catch the rhythm of words and a heart that stays constantly tuned to the station of brotherly love, Havens is a fellow traveler for freethinking ’60s grads and a father figure to those who wish they could’ve been there. As someone who falls in the gap, I can be easily mesmerized by stories of Allen Ginsberg, Hendrix, Dylan, and Woodstock among other things, and so I was willing to take the leap into Havens’ world. Like a new age beatnik who broadcasts the subterranean news through his songs, poems, artwork, and stories that reach across generations (his latest album is No One Left to Crown), Havens fits Jack Kerouac’s description of Beats as “characters of a special spirituality.” A self-proclaimed “song singer” and “all-around expressionist,” he was not only present, but he participated in the cultural shift that began with the Beats and carried over into a mass movement in the ’60s. And yet for Havens, the decade was just the staging ground for the bigger change that’s going to come, the one he says is taking place right now: He calls this phenomenon humanity’s becoming. “I’m blessed to see that we’re really just beginning on what it was we were supposed to be working at, in order to bring about the connection of all of us to each other,” he says. Back in 1958, when Richie Havens was a teenage doo-wop singer in the Bedford-Stuyvesant neighborhood of Brooklyn, the kids there called him a beatnik. Not knowing for sure what that meant, he took a train with a friend to Greenwich Village to see what he could find out. “We found out these guys in the neighborhood were talking about poets, and what they might’ve thought was derogatory became a very positive thing to us,” says Havens. It wasn’t long before he was reading his own poems in Village coffeehouses. “We’d sit at a table with our little books and Ginsberg would say, ‘What’s in those books? Get up there and read them!’ That’s how it began for me. “The music’s in the air, where every man is free,” sang Fred Neil on “Tear Down the Walls”, one of his early-period folk songs. “When I think about it, that’s a heck of a time, when almost nobody was asking those kinds of things or projecting them,” says Havens. “And Dino Valenti, ‘Love is but a song we sing, and fear’s the way we die,’” he sings, quoting “Get Together.” “He wrote it in 1958! We were awakening by these songs… I couldn’t wait for them to write another song so I could sing it from the audience with them.” Havens took to singing-along, especially while Fred Neil performed, “in harmony no less,” while Neil, who had a reputation as friend-to-the-new-folkie, advised him to get a guitar and learn his own. Three days later, Havens returned to the Village and began to perform six nights a week for the next six years. There were other teachers: He credits singer and activist Nina Simone and writer and activist James Baldwin as forces in creating an audience for a new brand of socially conscious black expression. He was invited to tour with Simone in 1963—although as they were literally traveling down the road together they overhead on the radio that President Kennedy had been shot. “It was one of the saddest days of my life and of course the tour was over. From that moment on there was a new depth in everything I sang or interpreted,” he wrote in his 1999 autobiography, They Can’t Hide Us Anymore. He cut some songs in the early to mid-’60s, but it was his 1967 and 1968 albums, Mixed Bag and Something Else Again, that revealed his own growing consciousness, as well as the imprint of Fred Neil, whose strong strumming style and suspended notes echo through Havens’ own work. Tangling with war and the civil rights issues on “Handsome Johnny” (the lyrics were written by his friend, actor Lou Gossett, Jr., himself a onetime Village folkie), he also took on “The Klan.” He laid down his famous version of Dylan’s “Just Like a Woman”, the song which he says personally illuminated the multi-dimensionality of womankind for him. Simone would go on to perform the Havens song “No Opportunity Necessary, No Experience Needed;” it was her commitment to dynamic, emotional song interpretation that also freed Havens to sing the songs of others in whatever mode moved him. And though Simone’s music defied boundaries, by virtue of his acoustic guitar strumming, Havens is most often put into the folk or folk-rock bag. “Freedom” is the name of Haven’s best-known song, the one that famously evolved out of an improvisation at the end of his accidental three-hour opening set at Woodstock. He and his two-man group were meant to be fourth on the bill, but they were thrown on stage as the first because, unlike some of the other acts, Havens and company were present and accounted for, easy to set up, and all importantly, had not ingested the infamous brown acid. After about a minute of freelancing a percussive riff in his distinctive open-D tuning, accompanied by an Afro-Cuban conga beat, he cried the word “freedom,” and then repeated it eight more times. “I just went with that… all of a sudden, ‘Motherless Child’ came out. I hadn’t sung that song in 14 or 15 years. I used to sing it early on in the Village.” He also slipped in a couple of secularized verses from a song he calls “I Got a Telephone in My Bosom” (a variation on the song that became known as “Jesus is on the Mainline”), which he learned during a brief gospel education. And though he was in a state of improvisational ecstasy, Havens could still sense that by participating in Woodstock, he was taking part in history. 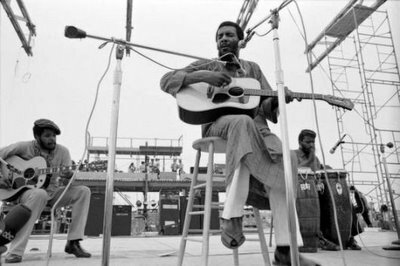 The Woodstock Festival and the Isle of Wight shortly thereafter introduced Richie Havens to audiences on a massive scale as a dynamic acoustic performer and ambassador of socially conscious song and thought. He never tires of his responsibility as a ’60s generational spokesperson, though he’s an even bigger supporter of youth and the environment; in 1990, he helped to found the Natural Guard in New Haven, Connecticut, an organization where kids began to “guard the natural” in their own surroundings. From a community garden that fed the homeless to a lead poisoning awareness campaign, kids spotted the problems and created solutions that had a lasting impact on their community as well as their own lives. “It really was based on children using their own community as the endangered environment. The most put-upon group is children.” Children from three different chapters were recognized by then-Senator Al Gore for their environmental justice efforts. 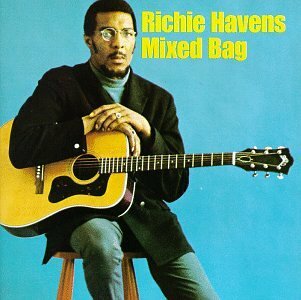 Of course, that’s easy to say if you’re Richie Havens, the boy who told his grandmother he intended to meet everyone in the world some day and a man who believes music can change the world. But can it, really? “Absolutely,” he says. “And it will soon.” —published on September 10, 2008 in Crawdaddy!